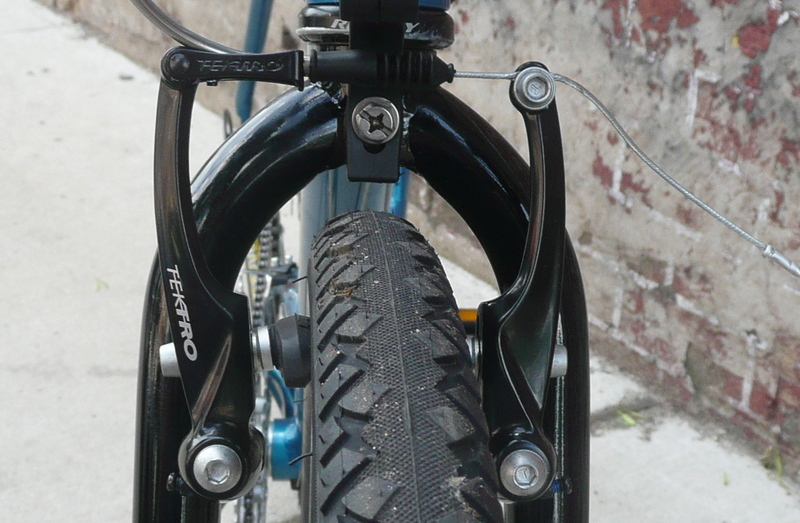 This is the front brake setup on a typical hybrid bike with V-Brakes. 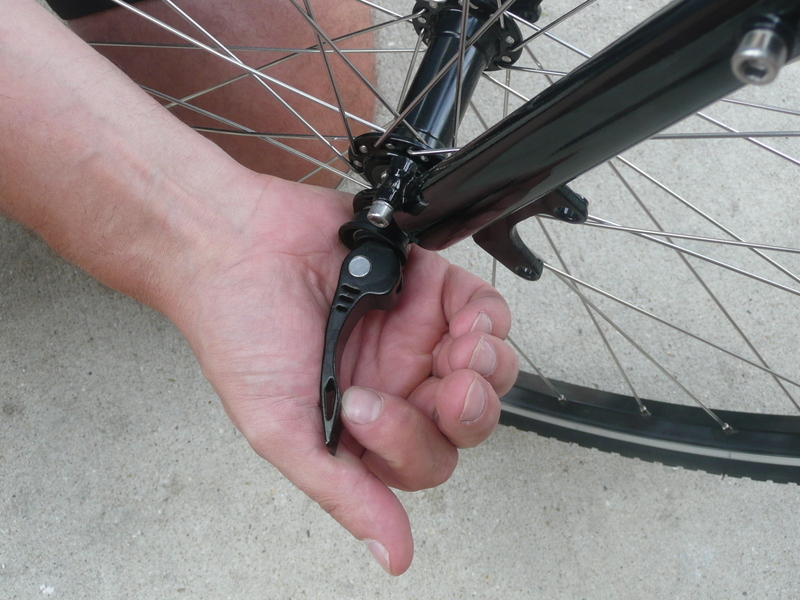 Despite the recent growth in popularity of disc-brake equipped bikes, it's fair to say that most urban riders in Chicago are using existing bikes with V-brakes, and may not know how to release the brakes to get the wheel out to change a flat or get the bike into a car. To release the brakes, you will need to manually squeeze the brake arms together, and lift up on the noodle to remove the cable stop from the slot. I find it easiest to push the brakes together with the heels of my hands while I manipulate the cable with my fingers. If you have larger hands, you may be able to squeeze the brakes together with one hand, and pull the cable with the other. You can now pull the wheel down and out, and lay your bike down, or rest it on the fork. 1. Do not overtighten the nut on the front hub. It should be just tight enough to allow you to close the quick release lever applying a reasonable amount of firm pressure with the palm of your hand, as shown The lever should clamp hard enough to leave an imprint on the palm of your hand. 2. Reattach the brakes by reversing the steps above. As a final step, lift up on the handlebars and spin the front wheel to see if it is moving freely. If not, don't panic! Without unhooking the brakes, flip open the quick release lever. This will allow you enough wiggle room to center the rim between the brake pads. Press the wheel axle firmly up into the dropouts, and re-tighten the quick release nut, as above. Now, close the quick release, and test the wheel again. Don't get frustrated. It may take a couple of tries if you've never done this before. The same guidelines apply to removing the rear wheel, however the procedure is complicated somewhat by the presence of the chain. We find it easiest to shift the rear (right) shift lever until the chain drops to the smallest cog, before attempting to remove the wheel. 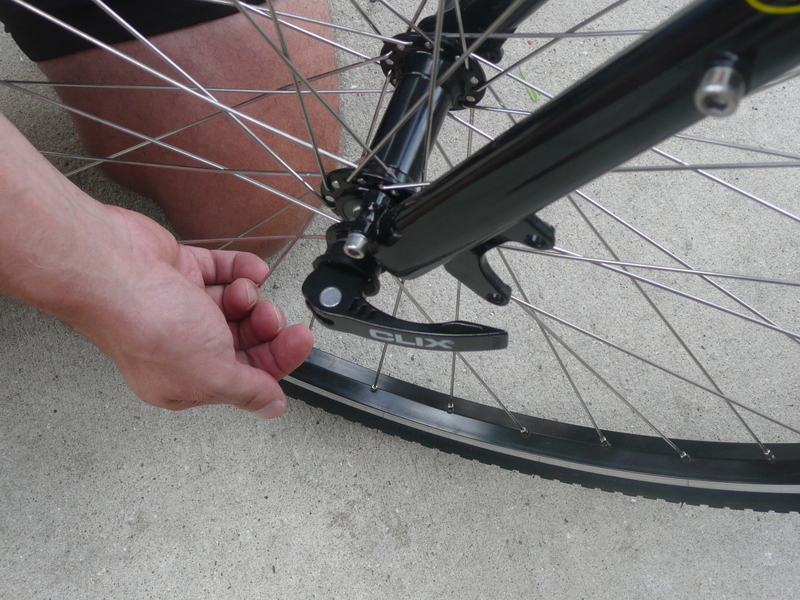 This will loosen the chain tension and make it easier for you to put the wheel back in when you are done. Then, pretty much follow the above procedure.